We’d love your help. Let us know what’s wrong with this preview of Ghost by Michael R. McGowan. Within FBI field operative circles, groups of people known as “Special” by their titles alone, Michael R. McGowan is an outlier. 10% of FBI Special Agents are trained and certified to work undercover. A quarter of those agents have worked more than one undercover assignment in their careers. And of those, less than 10% of them have been involved in more than five undercover cases. Over the course of his career, McGowan has worked more than 50 undercover cases. In this extraordinary and unprecedented book, McGowan will take readers through some of his biggest cases, from international drug busts, to the Russian and Italian mobs, to biker gangs and contract killers, to corrupt unions and SWAT work. 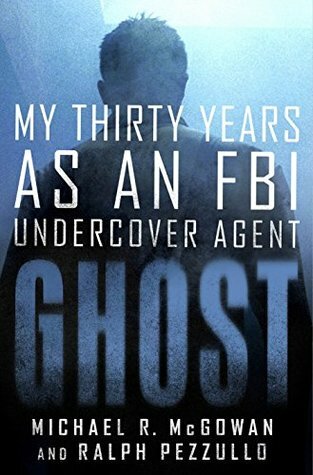 Ghost is an unparalleled view into how the FBI, through the courage of its undercover Special Agents, nails the bad guys. McGowan infiltrates groups at home and abroad, assembles teams to create the myths he lives, concocts fake businesses, coordinates the busts, and helps carry out the arrests. Along the way, we meet his partners and colleagues at the FBI, who pull together for everything from bank jobs to the Boston Marathon bombing case, mafia dons, and, perhaps most significantly, El Chapo himself and his Sinaloa Cartel. Ghost is the ultimate insider's account of one of the most iconic institutions of American government, and a testament to the incredible work of the FBI. Because I wrote this review for Criminal Element, I can't show it all here. Go here to read t Ghost is a fast-reading memoir featuring a largely no-nonsense cop who has an interesting tale to tell and some scores to settle along the way. The author, for all his tough-guy growling, is good company for just over 300 pages. That it’s a familiar story in its outlines doesn’t make it any less entertaining; you’ll get enough inside-cop and inside-crook stuff to feed your true-crime jones and then some. The author has more cojones than 99.9% of the population. A fascinating look at the dangerous world of undercover work in law enforcement. Bravo on a job well done! Interesting stories, some nail biting, but not as well written as James Comey’s book. The author is very smart, street smart and book smart, which enabled him to convincing play anything from a mafia street thug - a rich crime boss - or a tainted city official. Was fascinating to find out some of what we see in movies really does happen. Also can see what is over dramatized. Also truly, there are some really dumb criminals out there! I am usually a romance reader. This book showed up on my "you might be interested in" feed. I read the sample since I am not into real life and REALLY not into $14.99 for a book. I was hooked from the beginning. I read it in one day. I loved reading about his cases, his co-workers, and job politics. Thank you for sharing your story and life. This book was so well written and exhilarating throught it's entirety! I would recommend this to absolutely everyone! Might just be my favorite book to date! Nicely done Michael McGowen and thank you for your service to our country. I’m a big fan of FBI books and stories and this one is one of the best. McGowan is disruptive and an effective UCO acting as real life characters. Loved the stories about cases and how things got done. Wonderful story teller and I will look out for more from him. Loved this book! Had me hooked from page 1. So interesting and entertaining. Read it in 3 days! I really enjoyed this book. It was a page turner that I couldn't put down. Read in one afternoon. Wish I could give it 10 stars. Interesting ride-along with the FBI undercover operations. This book is a memoir of an FBI undercover agent. He tells fascinating stories about some of the cases he worked on, how he trained others and what it means to be on an undercover assignment. I first heard of this book on the radio where he was being interviewed by some sports talk show hosts. I was very interested in what he was talking about, how he described the cases and what being an FBI agent meant to him. Fast forward to getting his book a few weeks later… The book was just as good if not better than the interview. This book was very well written and kept me engaged throughout. I typically read at night, and found myself reading this well into the night. Out of the few books I’ve read this year, this may be the best one so far. It was more than a page turner, it was true. Great writing style, engaging, and kept you looking for more. Thank you to Mr. McGowan’s service and all that he has done for the United States. Highly recommended. I gave this book 5 out of 5 stars. Easy read - the writing is very straightforward. Fascinating scenarios, but it really doesn't convey the drama and tension that must have gone with the job. Nonetheless, thank you for your service. FBI Special Agent (Retired) Michael R. McGowan served more than 31 years of dedicated FBI service before retiring in 2017, almost all of which was working undercover against some of the most dangerous, sophisticated, and notorious criminal organizations and individuals. He now writes novels and consults to the entertainment industry.